Steaming mussels over white wine lends a hint of sweetness to these delicious shellfish. Your pressure cooker helps steam them more evenly in this quick and easy recipe. 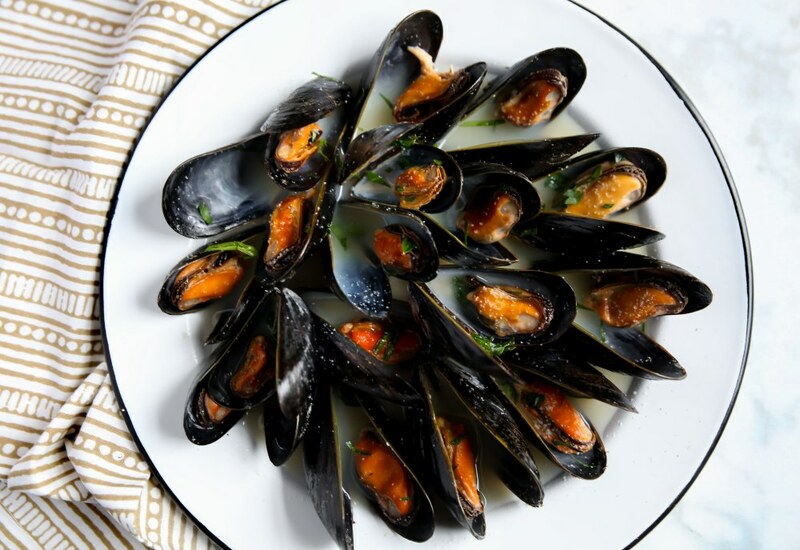 To prepare mussels for steaming, scrub them under cold, running water and remove the beards. (The beards are the bristly material sticking out from one side of the shell.) After only 15 minutes in the MultiPot you will have a bowl of mussels so elegant and delicious you will feel like you are in a French bistro! Stir wine, water, and garlic powder together in the pot of your pressure cooker. Tumble the mussels into the steamer basket, placing them rounded-side up to fit as many as possible. Lower rack into the cooker and place steamer basket on the rack. Close lid and set valve to Sealing. Press Pressure Cook and adjust cooking time to 1 minute at Low Pressure. When cooking time is up, release pressure through Quick Release valve. Tumble mussels into the steaming liquid in the pot to coat with the wine mixture before serving. Remember, any mussels that don't open naturally during the cooking process should not be eaten. Mussels can be served with slices of toasted bread or with a side of french fries. Per Serving: 294 calories; 7g fat; 12.6g carbohydrates; 36g protein; 85mg cholesterol; 562mg sodium. Great quick and basic mussels recipe. I tossed in a little butter and a squeeze of lemon at the end to add a little more flavor to an already delicious broth to dip my baguette in. I'm officially in heaven! These pressure cooked steamed mussels are perfect! The white wine and garlic give these mussels excellent flavor. They go perfect over a bed of pasta, great for date night! These mussels were so yummy! So simple and easy to make, thanks to the pressure cooker. I was a little intimated to make these, but now that I've tried it once, I can't wait to prepare these again! These steamed mussels were delicious! The garlic made a big difference in the overall taste. Also, there is no substitute for white wine, it's the best, and it truly makes the dish. This recipe was a lot easier than using a skillet to make mussels. I didn't have to wonder or question whether or not they were ready. I think it had an even better flavor, maybe pressure cooking infuses the white wine flavors in the seafood more than the traditional cooking method. This is the only way I will cook mussels now.